Outside Lands has finally announced their fully stacked 2019 lineup. It wasn’t news to us that Paul Simon will be in attendance for a post-retirement performance. We now know that Childish Gambino and Twenty One Pilots will be his co-headliners. 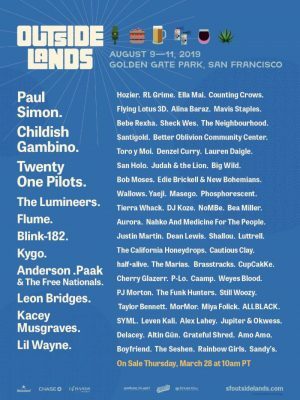 Outside Lands will return to San Francisco’s historic Golden Gate Park on August 9-11 for a weekend of music, art, and fantastic culinary experiences. Some other incredible artists set to attend are Flume, Kygo, Blink-182, Leon Bridges, Kacey Musgraves, and Lil Wayne. To everyones pleasure, Outside Lands will once again feature Grass Lands, an area in the festival solely focuses on cannabis. Introduced in 2018, the cannabis discovery area will display some of cannabis’ most thrilling developments in the field.